Katy says: This note from Spain’s EFE news service is sure to make some waves. 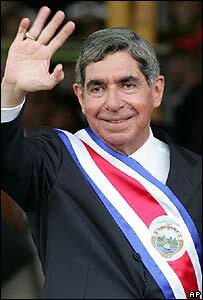 Costa Rican President and Nobel Peace Prize winner Oscar Arias made an unusually bold, scathing assessment of Chávez, chavismo and the hemisphere’s current ideological battles. “There is a simple difference between a dictator and a democrat: if the democrat has no opposition, it’s his job to create it, but the dream of the dictator is to eliminate all opposition”, said the Head of State and winner of the 1987 Nobel Peace Prize in an interview with Costa Rican radio station Columbia. Arias criticized that Chavez can now rule by decree for the next 18 months. “The fundamental difference in Latin America is between governments that believe in the need to insert their small economies into the world and those that do not; the latter group can afford to be protectionist and do not believe you need to look for markets, preferring alliances of another sort, such as the alliances between Venezuela and Cuba or Nicaragua and Cuba, that are certainly not commercial in nature,” said the Costa Rican President. “What can Nicaragua sell to Cuba? Nicaragua can sell much more to the United States, to China or the European Union. I don’t know what this bolivarian alliance is about other than the wish to remain in power permanently, for life if possible ,” said the Costa Rican President. Arias emphasized that Latin America should follow the road paved by Chile, which has signed more than 50 free trade agreements with countries all over the world, allowing it to become the most developed country in the region. “Bush is too much of a warmonger for my taste,” said the President. Chávez will surely unleash all his verbal and diplomatic demons on the Costa Rican president, but fear not, for mild-mannered Arias has tackled worse thugs before. Arias is the first Latin American head of state to call Chávez a dictator, and for that we applaud him.